BBI Development — Koneser is the talk of Warsaw! Koneser, a joint investment by the Liebrecht & wooD Group and BBI Development, harmoniously combines the original atmosphere and traditions of Old Praga with modern trends in shaping urban space. This mixed-use lifestyle centre (sprawling over an area of 5 hectares) is where culture and art, fashion and gastronomy, residential and office buildings coexist in the direct vicinity of publicly accessible areas for spending free time and getting together with friends. Koneser is a place of integration, continuously changing to adapt to the needs of city dwellers and to their initiatives. BBI Development closed the deal on the purchase of the former Warsaw Vodka Distillery in 2007. The urban and functional concept, as well as the architectural design of today’s Koneser, were drafted at the renowned Juvenes – Project studio owned by BBI Development SA and headed by Krzysztof Tyszkiewicz. In 2014, the Liebrecht & wooD Group acquired a majority share package in Koneser’s commercial part. Having joined the project, the Liebrecht & wooD Group took over the management of the development process and lease of Koneser’s commercial part, which it is now in charge of. The residential part remained a sole investment of BBI Development. A celebration held during the first edition of the Warsaw Koneser Festival symbolically marked the return of Centrum Praskie Koneser onto the capital city’s map. The festival started with the ceremony of giving Koneser Square back to the city. Koneser Square is a new public space that will host concerts, exhibitions, shows and other cultural events. ‘It’s easy to believe in projects that everyone supports. It is much harder to think outside of the box and see potential in places that have been overlooked forever. Old Praga and the former Warsaw Vodka Distillery stole our hearts right away. We knew that this massive revitalization project would be a challenge, but we also felt that this was a chance for creating something absolutely unique. Our business partners, investors and many tenants also believed in our vision of Koneser. It is thanks to all of you that we can now celebrate the success of Koneser, this one-of-a-kind, unmatched project,’ said Marc Lebbe, Managing Director at the Liebrecht & wooD Group. ‘Revitalization of Centrum Praskie Koneser was carried out with utmost respect for the traditions and historical identify of this quarter, to which we gave a new form and lustre. We owe a great ‘thank you’ especially to the authorities of the City of Warsaw, of the District and District Council of Praga Północ for their support of Koneser. Our capital needed projects like this one – that bring added value with their unique architecture and atmosphere. European districts are often associated with a specific landmark that acts as their visual symbol. We believe that Koneser has already become such a symbol of Old Praga. We are proud of the effects of our multiannual work’, added Michał Skotnicki, President of the Management Board at BBI Development. 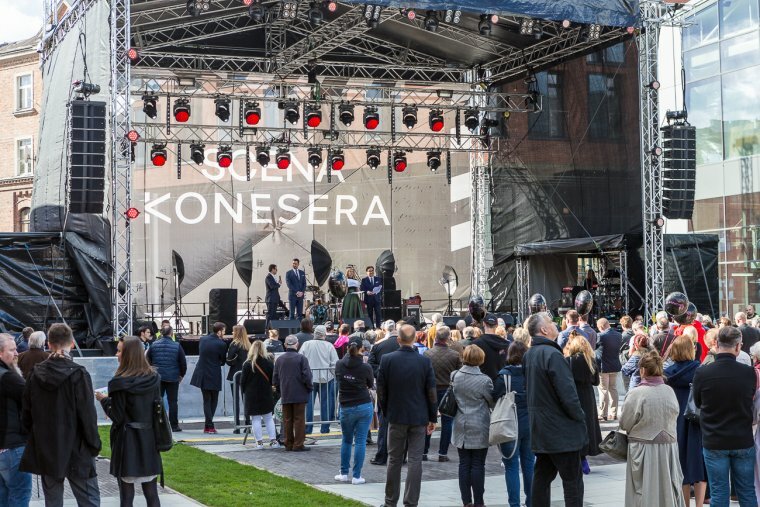 The ceremony of giving Koneser Square back to the city was attended by representatives of the authorities of the City of Warsaw, of the District of Praga Północ and of the District Council of Praga Północ. Janusz Owsiany, an outstanding expert on the history of Warsaw and a great friend of Koneser, as well as entities that shared the vision of the investors from the get go, received special trophies. A trophy was also awarded to Andrzej Szumowski, CEO of the Polish Vodka Foundation, initiator and patron of the Polish Vodka Museum located on Koneser’s premises. Next, representatives of the Liebrecht & wooD Group (Marc Lebbe, Patrick Van Den Bossche, Magdalena Bartkiewicz-Podoba and Filip Van den Bossche), of BBI Development (Michał Skotnicki, Rafał Szczepański, Krzysztof Tyszkiewicz and Piotr Litwiński) and of Juvenes – Project (Krzysztof Matwiejuk and Sławomir Stankiewicz) revealed a commemorative plaque by Andrzej Pągowski. Warsaw Koneser Festival is an special annual cultural event – with great music, shows and workshops. This year’s musical line-up included stars of such format as: Hańba, Pablopavo i Ludziki, Krzysztof Zalewski, Jazz Band Młynarski-Masecki, Kapela ze Wsi Warszawa, Warszawskie Combo Taneczne, Michał Fogg and Wojtek Mazolewski in the project called Chaos pełen idei (with Ania Rusowicz, John Porter and Misia Furtak). Klub Komediowy, Pożar w Burdelu and Komuna Warszawa gave stage performances. During the festival weekend, 55,000 people visited Centrum Praskie Koneser. Cultural events have been held at the former Warsaw Vodka Distillery since the acquisition of Koneser by BBI Development in 2007. It has been a home to theatres (such as Wytwórnia or Konsekwentny), art galleries (e.g. Klima Bocheńska’s), bars and clubs (Czysta Ojczysta, Sen Pszczoły) and it has hosted previews of art exhibitions of the Academy of Fine Arts in Warsaw, the Warsaw Autumn Festival and Męskie Granie concerts and theatre shows by such directors as Krzysztof Warlikowski or Pożar w Burdelu group. Koneser has also been a partner to artistic activities held as part of the Open Ząbkowska Street project. The Museum of Warsaw Praga (in organization) had its temporary seat here before moving to its permanent address. Today, Koneser’s event space includes not only the plaza, which is open to the public, but also event centres Laboratorium 2400 and Butelkownia, as well as publicly accessible passageways. Koneser Square, Laboratorium and the passageways are already open, while Butelkownia will be officially opened in the autumn of this year.